Automating labor management processes or upgrading to a more robust time and attendance system are both intelligent business improvements. Your time and attendance system controls the automation of your HR policies and is critical in generating an accurate payroll. Before selecting a new system, it must be determined what functionality your organization requires: What will be the most accurate method of data collection, i.e. biometric fingerprint time clocks? How is time collected for employees in the field? How will employees make time off requests? What types of reports will be useful to managers? What level of scheduling and project tracking is required? Is employee self-service a priority? If you are in the midst of selecting a new time and attendance system, this document will prove useful. 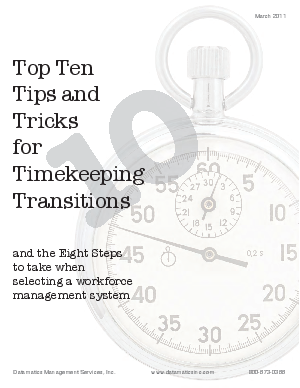 Along with an eight-step methodology to help streamline your selection process, industry experts provide best practices for maximizing ROI when making timekeeping transitions.